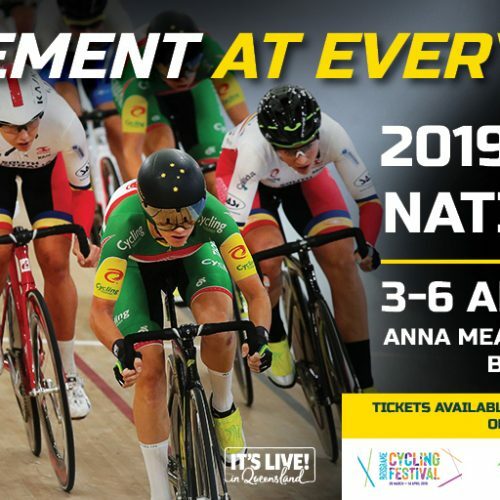 Canberra’s Nathan Hart (ACT) celebrated a maiden national sprint title in a dominant display on day two of 2019 Track Nationals at the Anna Meares Velodrome on Thursday evening. In the women’s sprint, Caitlin Ward’s (VIC) tilt at a maiden sprint crown opened with an impressive sub-eleven second ride which topped qualifying ahead of two-time former champion McCulloch (NSW). 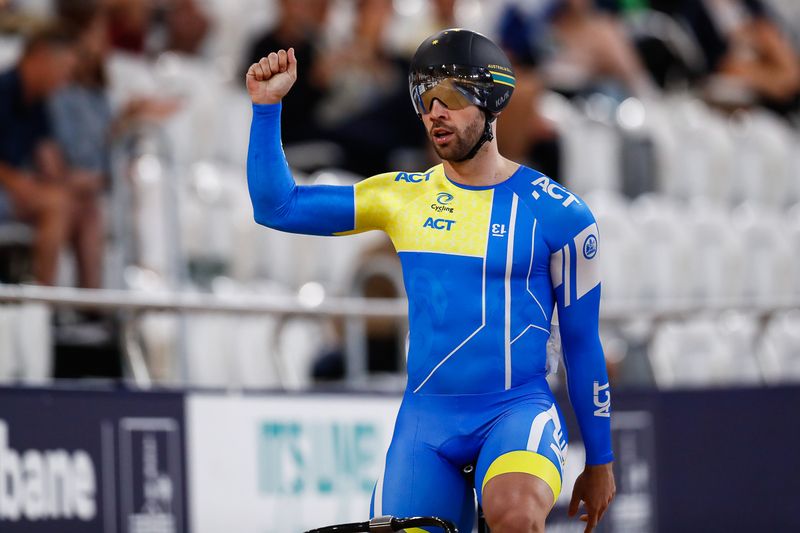 Renowned for his blistering speed leading Australia’s Olympic and World Championship team sprint outfit, Nathan Hart (ACT) showcased his individual excellence as he smashed through the field claim his maiden sprint national crown. Topping qualifying on Wednesday afternoon with a time of 9.762seconds, Hart opened Thursday’s schedule with a quarter-final defeat of New South Wales’ Charles Hoffman before shifting gears to knock out Olympian and 2017 champion Patrick Constable (SA) in straight heats. South Australia’s James Brister took it to Hart in the final, however, he had no answer for the Canberran’s bursts of speed as Hart roared to the win without dropping a race. “This is a bit surreal, I’ve been on the podium a fair few times but being able to put on the green and gold jersey for the first time is pretty special.” Said Hart, twice a medallist in the event after claiming bronze in 2017 and silver in 2014. “I came up against a really good mate of mine Patty Constable in the semi, so that was a tight battle, and with the short breaks between heats, it was definitely a tough day of racing. 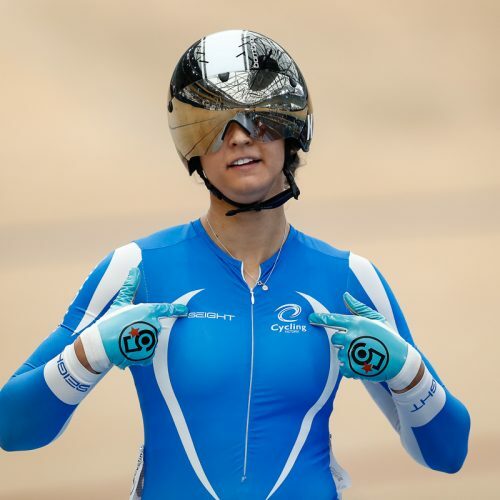 The win continues the extraordinary season from Hart who claimed sprint gold at the New Zealand leg of the World Cup in January, before finishing sixth at last month’s World Championships. In the ride for bronze, South Australia’s Patrick Constable defeated Conor Rowley (VIC). The elite women’s sprint action continues on Friday with Victoria’s Caitlin Ward (10.997) topping Thursday’s qualifying. Ward, who claimed silver in Wednesday’s time trial, finished just .02 seconds ahead of time trial gold medalist New South Wales’ Kaarle McCulloch (11.023). “This is my best ever performance in competition, this is my eleventh national championships and it is the first time I’ve ever qualified first so I am really stoked,” said Ward. In the under 19 individual pursuit, Ashley Jones (VIC) held off a Queensland charge as she took gold ahead in a time of 2mins 25.599sec in a close final against hometown favourite Lauren Robards (2:26.694). Fellow Queenslander Francesca Sewell (2:28.247) claimed the bronze medal. In the men’s final, Bill Simpson (3:19.554) completed the double for Victoria beating Queensland’s Liam Walsh (3:21.477) by two seconds while Oliver Bleddyn (WA) rounded out the podium. Sam Gallagher continued Victoria’s under 19 gold medal haul with sprint gold over South Australia’s Carlos Carisimo. The battle for bronze saw John Trovos (NSW) overcame Queensland’s Brandon Hutton. South Australia’s Heather May grabbed the green and gold jersey in the under 19 women’s sprint after beating New South Wales’ Eliza Bennett, with May’s team sprint partner Tia Slama claimed the bronze medal. “It feels great to win the green and gold jersey this year, last year I was really happy to get bronze and after losing the first heat in the final this year, I thought I would be happy with silver. So being able to come back like that makes me ecstatic,” May said. May is relatively new to cycling, moving across from gymnastics to cycling through a talent identification program. “I was always watching cycling at the Olympics and it looked really cool so I gave it a shot and here I am… it’s a great sport”.